This project is aiming towards establishing a new paradigm for Rydberg many-body physics. It draws its strength from the unique features of our single-atom based many-body Rydberg architecture: We will place well defined sets of up to a few hundred single rubidium atoms at exactly defined locations in re-configurable 2D geometries, based on 2D dipole trap arrays with single-site addressability. Site spacing can be selected in the range of 3 micron to 30 micron. For each configuration, site-selective modifications of the trapping parameters are possible and will allow for the introduction of defects of various kinds. Excitation to Rydberg states and Rydberg-mediated interactions will be made site-selectively as well. Rydberg-mediated interactions evoked by laser-aided excitation to Rydberg states will be implemented with single site control. Our micro-optical approach is readily capable to create large registers with more than 300 microtraps for single atoms, giving atom numbers comparable to optical lattices and being one order of magnitude larger than for multiple focused beam configurations that have been used to study Rydberg excited systems so far. 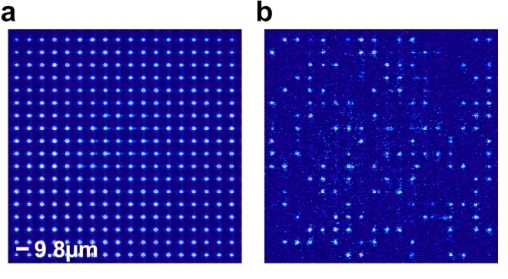 Based on our previous work on square 2D geometries, we will extend the range of possible geometries to hexagonal configurations and increase the optical resolution in a new setup which is optimized for Rydberg excitation of rubidium. Each site is generated by a single microlens out of a two-dimensional microlens array. In combination with a spatial light modulator this gives access to a full control of the trap parameters at each site. In this fashion, freely definable structures of Rydberg atoms with exactly known mutual separations and interaction parameters are created. This avoids the statistical averaging of interaction strengths for atom ensembles not having single-atom site control. (a) 18 x 18 site detail showing the averaged fluorescence at the resolved trapping positions. (b) in-situ detection of single Rb atoms at individual sites in the same register.